Notice the slotted filter ring, the thread mount for camera adapters, and the fine quality lens case. The 400/5.6 Tele-Kilar was produced from about 1952 to 1968. This is the only Kilfitt lens I have encountered in its original case, with its original glass plate lens test still intact. 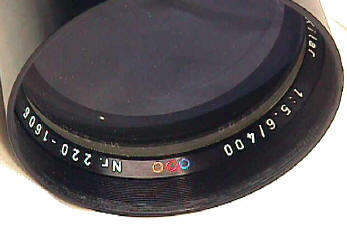 This separate profile is shown because it is so unusual to find this lens complete in this condition. 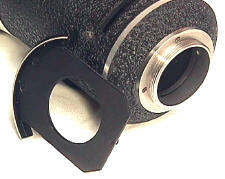 With the proper Kilfitt adapter, it could be fitted to most popular 35 SLRs of the day. 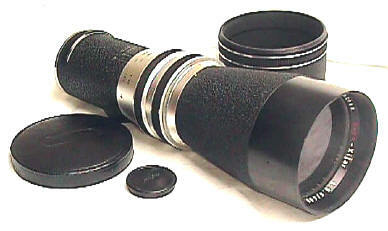 Separate profiles show other Kilfitt and Zoomar lenses, as well as Kilfitt-Zoomar history. The 400/5.6 Kilfitt is arguably the most famous Kilfitt lens, and one of the most famous camera lenses EVER. 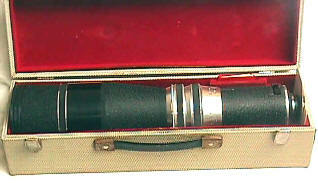 The 400/5.6 co-starred with Jimmy Stewart and Grace Kelly in Alfred Hitchcock's 1954 film "Rear Window" mounted on an Exakta.